For the second consecutive year, Nutritional Development Services received a generous donation for its Summer Meals Program from students at Saint Joseph’s Preparatory School. The donation which totaled nearly $5,000, included equipment, activities, games, and arts and crafts for the children. The drive was initiated by service driven students and conducted via the fundraising website YouGiveGoods.com. NDS’ Summer Meals Program is served at a variety of sites throughout Philadelphia including play lots, front yards, and churches that may not have structured activities associated with their meal service. Often volunteers need basic supplies such as tables, chairs, and tents to run the program efficiently. In addition, they need supplies to enrich their programs with physical activity, crafts, and games. Athletic teams and extracurricular groups from the Prep competed against one another to raise the most donations. 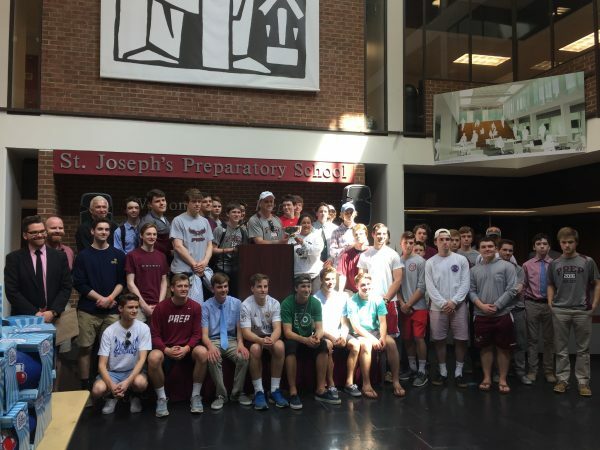 The winner, the hockey team, raised the most donations and was presented the Hurtado Cup, which is connected to the school’s Hurtado Food Pantry. The pantry supports local community organizations combating hunger. It is named after Saint Alberto Hurtado, a Jesuit priest from Chile who was a prominent leader in the fight against poverty and hunger in the early 20th century. In 2016, NDS’ Summer Meal Program served approximately 415 sites. Through this program, NDS provided 182,400 breakfasts, 174,800 snacks, and a combined 402,800 lunches and suppers The Summer Meals Program is federally funded and operated nationally by the U.S. Department of Agriculture and administered by the Pennsylvania Department of Education.